“My name is Carmen, and my husband is Joe. Two years ago my family and I talked about wanting to become a foster care family. It was a long hard decision. For me, the idea of fostering started a long time ago, but I wanted my kids to be old enough to understand the reasons behind this journey before we took that step. When I was about 2 or 3 years old, I was put in the foster care system. I understood what was happening to me – that I was going to have new parents – but that’s still a hard thing for a child to deal with. When I became an adult, I wanted to give a child the same gift I was given. My husband was behind me all the way, and when I spoke with my three children and the rest of my family, they all stood behind me too. Being a foster child is not easy, and our first foster was a challenge, but we kept going. You have to available for them, to help with things like appointments or to see their families. You have to open your heart and home to give them love and guidance, you have to be open to learn what they need, and you have to be accepting of their families. Not all families are easy to deal with. But it helps when you have a great support system like the people at KidsPeace. You need to be understanding of what the biological family goes through. Your heart has to be in the right place – meaning you’re not doing it for glory. You must be willing to love them and make them feel important and part of your family, whether it’s for a short time or long term. It’s hard not to get attached to them when you hear some of the backgrounds they come from. When your child coms to you at the end of the day, and tells you, “I know you are trying to help me and my family,” that is the best feeling. 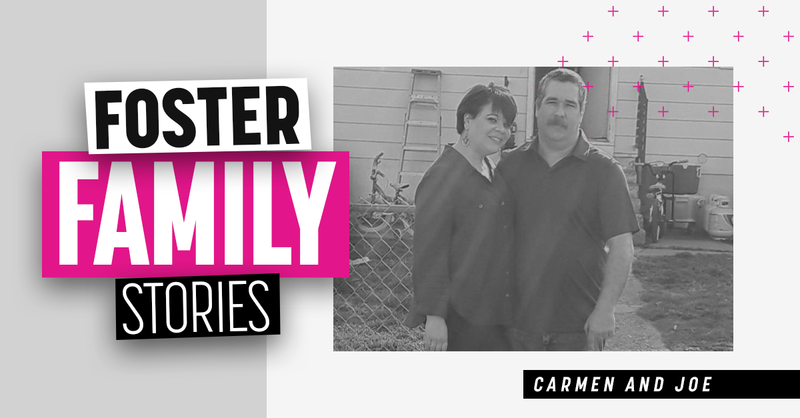 Carmen and Joe Rasmussen are foster parents in Pennsylvania.